Two of my nephews graduated this year from highschool and their parents are very happy and proud of them because of what they have achieved. They survived 4 years of highschool life learning and gaining educational experience. I know they have fond memories of their higshchool life and they will forever cherish them until they alive because for me and maybe for a lot of us, HS life are the best and worth remembering. As a graduation gift, my nephew Dither got this beautiful HP laptop from his parents just a week ago. He has done great in highschool for he has good grades and even received numerous awards and certificates. He definitely deserves to have a gift for all his hard work. 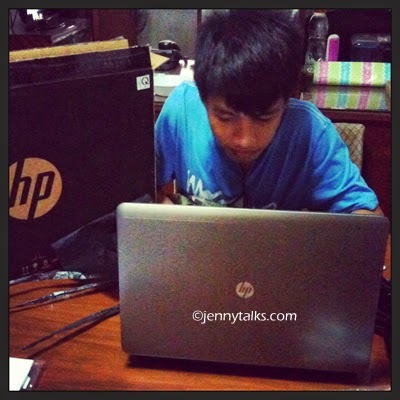 He'll be replacing his old handdown laptop from his cousin and will use this new one for his studies in college soon. I just pray and hope that he will use this with care and responsibility for it can really help him with his studies and research. This coming school year of this year, both of my nephews will embark into a new journey of their educational life as they will form a foundation for their careers in the future. Dither will be taking up Computer Engineering and we all know that he will be good in his studies for he is studious student and I hope he will carry that trait up until his college days. Wishing him all the good luck and hope he'll gain more experience (this is for sure!) in college.